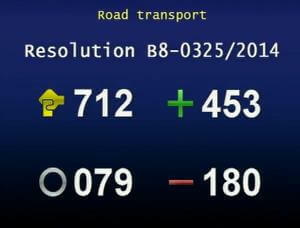 In its plenary meeting of today, Wednesday 17 December, the European Parliament has rejected the European Commission’s list on categorisation of infringements for road transport with 453 votes in favour and only 180 against. The list is of key importance for the sector since it leads to prohibiting access to the Community market of those hauliers who repeatedly and systematically commit infringements against a number of EU legal acts such as the driving and rest time rules or the rules concerning the maximum weights and dimensions of commercial vehicles. ETF objected the list in its current form, mainly because it failed to include illegal cabotage and infringements to social and labour rules applicable to road transport. “In other words, a haulier performing illegal cabotage would have been able to continue to operate freely within Europe, keeping its good repute status. We find it unacceptable that illegal cabotage was excluded from the list while the European Commission, the leading institution in drafting the document, has lately been urged by Member States and social partners to adopt measures for a better enforcement of cabotage rules,” said Roberto Parrillo, President of the ETF Road Transport Section. Categorising infringements by their gravity and frequency is part of a system whereby the involved haulier would be subject to an administrative procedure and, as a result, may lose the good repute and the right to operate within the Internal Market. Much expectation was built around this initiative. The list was supposed to be an important step in re-establishing fair competition in a sector where in recent years dumping practices and social fraud have taken the lead, driving compliant road transport operators out of the business. “The European Parliament vote of today conveys a clear message, namely that the list fails to address the major problems the sector faces today: modern slavery, living and working conditions, distortions of the domestic road transport and labour markets,” added Cristina Tilling, ETF Political Secretary in charge with this sector. The ETF would like to thank the Members of the European Parliament for having understood the importance of this list as an instrument to make road transport in Europe more socially and economically sustainable.